Delightful farmhouse located on two levels, for a total of approximately 145 sqm situated in a panoramic position. The house in question is in good condition, healthy structure, built in brick stable in the interior floors and roof (both wood), ready to be made ? ?habitable with only a renovation of facilities and general polish. Absolutely to recover and maintain, unique beauty and the beautiful terracotta floors pianchette (present on both the ground and first floor), which require only one treatment to be given to the normal state. And 'possible to derive the ground floor a kitchen with fireplace, living room, bathroom and utility room whilst to the first floor you will get three bedrooms and a bathroom. Externally the house is in good condition. The house has an area of ? 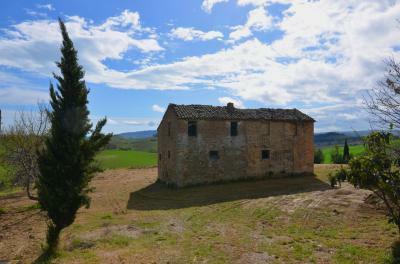 ?about 23000 square meters with some olive trees and a brick outbuilding of 20 sqm to be restored. Located in a beautiful countryside location, this residence is ideal for those looking for a permanent housing solution for occasional or weekend, immersed in the tranquility and greenery with wonderful views over the valley and on the mountains with a small glimpse of the Adriatic Sea. Electricity or running water present.